Thank you so much for all the comments I received both here and on Facebook regarding my post last week on Creativity & Vulnerability. Many of you commented that you felt the same way which encouraged me. So often we sit in our small corner thinking we're the only one. But we're not the only one. I thought I'd share some of the comments and answer a few of them. Eva commented: Ultimately if you want to make art you will make art. You need to ask yourself why you will do almost anything to avoid doing the one thing you say you want to do? There is the possibility that you do not want to make art and that is why you cannot commit. I have considered Eva's last point many times before I wrote the original post. I have asked myself whether giving away all of my art supplies and textile supplies would be the sensible route to take. But I know that I am supposed to be creative. I know that I am good at what I do when I actually get down to it. Plus it isn't just my creative life that I was thinking about in my post. Quite often I feel as though I live on the periphery of my own life. Commitment and vulnerability applies to all areas of life not just creativity. But I am getting there. Especially if I stop saying negative things to myself. I saw your post via Studio 11 Eastbourne. I really enjoyed reading it - spoke to me in a BIG way! You and I are practically interchangeable in our thoughts (and more thoughts!) and struggle to just DO already! Oh the stories I could tell ... �� I do understand about the "vulnerability" - still working on that in the rest of my life too. In my own creative work experience, I needed to take the "commitment" part one step further - to include in a self-worth piece. That, even in the midst of my struggling, idea filled, planning, course taking, technique searching and overall, unproductive creative life - my creativity and I are worthy of time and commitment. It has been a very, VERY long (and still continuing) process to commit to purposefully setting aside time, then honouring and being respectful of that work time both to myself and in my time with others. Thanks so much for sharing of of yourself Bernice �� keep on moving forward beautifully! Beverlee, thanks for taking the time and effort to write. Karen: It is a real struggle between creative thought, process & product,...I find the more I create, the more it helps clarify what I'm thinking, which in turn, can often create more ideas & thinking...a creatives ongoing conundrum!! Lorna: Thanks for your lovely words, they have certainly mirrored what I have been doing. I must take risks and instead of thinking, start creating and hopefully be pleased with what I have produced. Sue: I loved this post Bernice! I can be an over-thinker too! I will frequently work out the problem of a piece in my head for so long that I decide that I no longer need to do it! My encouragement to you is just to run with it-do what comes to your heart. Style, voice-these evolve as you grow and expand as an artist. No matter what you do there will be an element of who you are captured within the work. I so understand what Sue means about thinking about it for so long that there's no longer a need to do it! When I was a primary school teacher I loved all the planning but by the time I came to teach what I had planned I was bored with it. And that's a risk with my creative work too. I've overthought it for so long that I no longer want to carry on with it. I had a mentoring follow-up call with Christine last week and we talked through some of these issues. She was such a great encouragement to me. I thoroughly recommend finding a mentor. And following on from the reading of some of the books on creativity, I think it's really important to find like-minded people to meet with and talk to - people who will encourage you in your work - be critical when needed - supportive and understanding. Lorna and I are going to start meeting up on regular basis. Hopefully we will find some other like minded textile peeps who live locally who would like to join us. Thanks again to all those who read my blog post and a special thanks to those who left comments. When I received the feedback from Christine on our mentoring days, an optional extra was to read some of the books she listed. I started with Austin Kleon's 'Steal Like an Artist - mostly because it's small and easy to read. He made some really interesting points so I was glad I read it. Then I moved on to 'Imagine' by Jonah Lehrer. This was such an interesting read. It delves quite scientifically into how creativity works. There are some really interesting insights into how people work collaboratively. I really enjoyed finding out about companies like 3M and Pixar. Christine also recommended Julia Cameron's 'The Artist's Way' which I have read but didn't do the 12 weeks of work. As I couldn't find my copy I looked online and discovered Julia had written a new version called 'The Artist's Way for Retirement'. It has some extra activities in it, however I haven't got past chapter 1. While I was at Christine's studio she had shown me Denise Lach's 'Calligraphy' which I ordered online and then decided to buy 'Journeys into Calligraphy also. I saw this book whilst I was at Littleheath Barn so I decided to get myself a copy. I have done one of the activities in it. And then I booked to go to a workshop with Bobby Britnell which I hope will help me. And this book was mentioned in the Visual Language Book. Whilst I was at Julia Triston's workshop in Stroud I bought a copy of her book. I bought 'Approaches to Stitch' because it sounded interesting. In my quest to find my voice, style and get-up-and-go (see this post), I bought this book. I've read part of it and it's really good - if only I actually did the suggested exercises. I was a bit put off by the chapter on chakras! And lastly I just had to have the latest Lynda Monk book. And now I'm going to call a halt to my book purchases. I have to! Not because my credit card is crying but because I need to read them and do something with what I have learned from them. What are your favourite books on creativity? Last year I did Christine Chester's 'Poetry of Decay' workshop. I went straight home and booked my next workshop with her, 'Paper Lamination', which was hosted by InStitches. All that was left! I didn't apply enough matte medium. Lesson learned! The large gap is because the map looking paper peeled straight off. I think it was a waxed paper. The next exercise involved fabric, tissue paper, pencil crayons, gesso and the sewing machine! On day two we tried lightly brushing gesso onto fabric to laminate a photcopy. Sadly I brushed too much gesso so it doesn't look as distressed as I had hoped. This was images of Venice with a 'watery' Thermofax screen. I was so pleased that the last one was the best. It's so good to know when you have improved over two days! All my samples laid out for the show and tell. Book now: Christine will be doing this workshop in 2019 courtesy of Textile Explorations. Sign up for the newsletter so that you get all the news first. I'm an over-thinker! I don't doodle, draw or journal - I just think. I write whole blog posts in my head. Or write a journal page in there. But these thoughts don't leak out anywhere. Not into a book, or the internet or into any piece of work. So I've been thinking about why these thoughts don't escape. I have empty notebooks that I've bought to write in but I don't write in them. I've been exploring how to find my own voice - my unique style. I've been reading books and articles about it. I haven't done any work. And then I read this in a book on creativity: 'I distrust styles. To have a style is to be trapped!' (Milton Glaser) What! Back to the drawing board! Or in my case, back to the over-thinking! I wrote about taking Risks. I haven't taken any recently. I told you I seem to be risk averse. However I do have a risk planned for next week! Can you plan risk? Or should taking a risk be more spontaneous? There's something to think about!!! One of the things we discussed was my feeling that I did too many workshops and the skills and techniques I learned didn’t translate into finished pieces. Christine wrote this in the tutorial notes: “One of the key shifts in perception is that process should be subordinate to your ideas – that does not mean that process is not important – far from it. But it does mean that you are making the idea the key feature, rather than the process. This should keep the communication of your idea clearer – either visually to an audience, or at least in your mind in light of having to write artists statements.” This is quite a shift in perception for me and I am still processing it. And the thinking and the reading and the thinking and the writing things in my head has all been part of the processing and perception shift. Why do I keep taking workshops to learn new techniques? Why haven't I found my own voice yet? What stops me finishing things? What stops me starting things? Why don't I stop thinking and get on with it? Should I have a sketchbook, visual journal or logbook? I'm not the only one then! Although she does start and finish pieces. . . . . it came to me! It's about commitment and vulnerability. The answer to all those questions is commitment and vulnerability. If I keep on doing technique classes then I don't have to put any of me into the samples. I haven't found my creative voice because that would mean I have to invest some of me into it. Probably all of me! Even writing in a journal - which is for my eyes only - means showing up and being vulnerable. Writing it down (or speaking it out) makes it more real. And as for commitment - that means doing the stuff! And that takes effort. I draw back from things that take effort. Which is odd because when I worked, I worked hard. I put lots of effort into everything I did. I can be fiercely loyal and determined. Many people would say 'I go the extra mile' for them. So why can't I do that for me? For my creative work? For my relationship with God? For my relationships with friends and family? 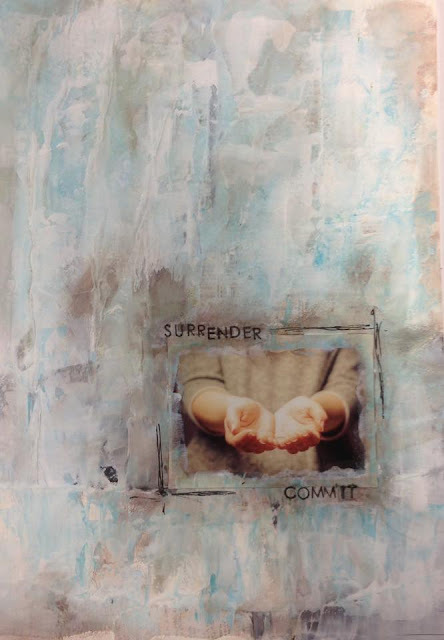 Looking for an image to go with this post I found this piece of artwork I did in March at a retreat. Obviously the thinking has been going on for a while! You might be thinking - and I've been thinking it too - if I'm so reluctant to make myself vulnerable in something as private as a personal journal, why am I writing this blog post? Because I have to break out! Make a breakthrough! Allow myself to become more vulnerable - to invest in my creative life and the rest of my life. Break down the walls that I have built around myself. And pressing publish on this blog is just the beginning. Thank you for sticking with my disjointed meanderings today. Where are you on your creative journey? My last post about our trip to North America is a return to creativity. 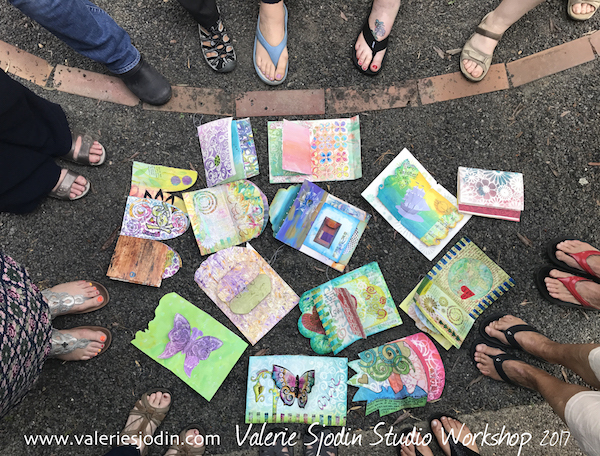 We had organised the whole trip around me being able to take an inperson class with Valerie Sjodin. I had signed up for her online courses but it is so great to be able to be in the same room as the tutor. The workshop began on the Friday evening playing with paints and shaving cream. First we looked at the paints we had taken with us. Or in my case - had nipped into Blicks and bought on our arrival in Portland! Lots of photos coming up. Some of my painted papers. Preparing the shaving foam and paint. The scrapings from the shaving cream prints. Over the next two days, Valerie showed us different techniques and we all worked at our own rate producing very different books. I sewed the pages of the book together. I drew through a stencil on the cover. I didn't like the green stencilled page so I stuck one of the sheets od Deli paper over it. I really struggled with this centre page. You will see what I ended up with later. Valerie was available the whole time to encourage and to suggest ideas. Many of her journals were on display so you could find ideas. Here are the pages of my finished book. I ended up cutting out circles from the very first paper we painted and then using a Michelle Ward stencil to doodle over the top. It reminded me of the Chihuly glass we'd seen. And here's everyone's books opened at their favourite page. Thank you Valerie and everyone else for such a great weekend.